The initial block output depends on several factors such as the Initial condition parameter and the simulation start time. For more information, see Initial Block Output. The External reset parameter determines if the block output resets to the initial condition on triggering. The Show enable port parameter determines if the block execution is controlled in every time step by an external enable signal. The output in the first few time steps of the simulation depends on the block sample time, the delay length, and the simulation start time. The block supports specifying or inheriting discrete sample times to determine the time interval between samples. For more information, see Specify Sample Time. The data input port u accepts variable-size signals. The other input ports do not accept variable-size signals. The output port has the same signal dimensions as the data input port u for variable-size inputs. The rules that apply to variable-size signals depend on the input processing mode of the Delay block. The signal dimensions change only during state reset when the block is enabled. The initial condition must be scalar. The data input port u accepts virtual and nonvirtual bus signals. The other input ports do not accept bus signals. The output port has the same bus type as the data input port u for bus inputs. To use a bus signal as the input to a Delay block, specify the initial condition on the dialog box. The initial condition cannot come from the input port x0. Support for virtual and nonvirtual buses depends on the initial condition that you specify and whether the State name parameter is empty or not. Input data signal delayed according to parameters settings. Delay length specified as inherited from an input port. Enabled when you select the Delay length: Source parameter as Input port. Enable signal that enables or disables execution of the block. To create this port, select the Show enable port parameter. External signal that resets execution of the block to the initial condition. To create this port, select the External reset parameter. Initial condition specified as inherited from an input port. Enabled when you select the Initial Condition: Source parameter as Input port. Output signal that is the input signal delayed by the length of time specified by the parameter Delay length. The initial value of the output signal depends on several conditions. See Initial Block Output. Specify whether to enter the delay length directly on the dialog box (fixed delay) or to inherit the delay from an input port (variable delay). If you set Source to Dialog, enter the delay length in the edit field under Value. 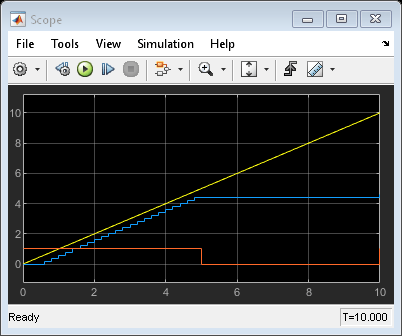 If you set Source to Input port, verify that an upstream signal supplies a delay length for the d input port. You can also specify its maximum value by specifying the parameter Upper limit. Specify the scalar delay length as a real, non-negative integer. An out-of-range or non-integer value in the dialog box (fixed delay) returns an error. An out-of-range value from an input port (variable delay) casts it into the range. A noninteger value from an input port (variable delay) truncates it to the integer. Specify whether to enter the initial condition directly on the dialog box or to inherit the initial condition from an input port. If you set Source to Dialog, enter the initial condition in the edit field under Value. If you set Source to Input port, verify that an upstream signal supplies an initial condition for the x0 input port. 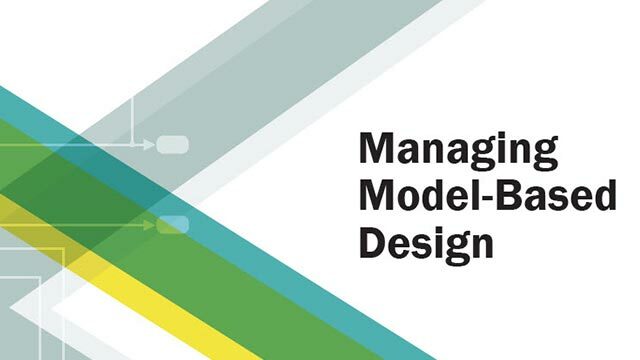 Simulink® converts offline the data type of Initial condition to the data type of the input signal u using a round-to-nearest operation and saturation. When State name must resolve to Simulink signal object is selected on the State Attributes pane, the block copies the initial value of the signal object to the Initial condition parameter. However, when the source for Initial condition is Input port, the block ignores the initial value of the signal object. Select to use a circular buffer for storing the state in simulation and code generation. Otherwise, an array buffer stores the state. Using a circular buffer can improve execution speed when the delay length is large. For an array buffer, the number of copy operations increases as the delay length goes up. For a circular buffer, the number of copy operations is constant for increasing delay length. If one of the following conditions is true, an array buffer always stores the state because a circular buffer does not improve execution speed. For sample-based signals, the delay length is 1. For frame-based signals, the delay length is no larger than the frame size. Select to increase the delay length from zero to the lower limit for the Input processing mode. For sample-based signals, increase the minimum delay length to 1. For frame-based signals, increase the minimum delay length to the frame length. Selecting this check box prevents direct feedthrough from the input port, u, to the output port. However, this check box cannot prevent direct feedthrough from the initial condition port, x0, to the output port. To enable this parameter, set Delay length: Source to Input port. Select to remove code that checks for out-of-range delay length. Generated code does not include conditional statements to check for out-of-range delay length. Generated code includes conditional statements to check for out-of-range delay length. Specify whether to produce a warning or error when the input d is less than the lower limit or greater than the Delay length: Upper limit. The lower limit depends on the setting for Prevent direct feedthrough. If the check box is cleared, the lower limit is zero. If the check box is selected, the lower limit is 1 for sample-based signals and frame length for frame-based signals. Select to control execution of this block with an enable port. The block is considered enabled when the input to this port is nonzero, and is disabled when the input is 0. The value of the input is checked at the same time step as the block execution. Specify the trigger event to use to reset the states to the initial conditions. Specify the time interval between samples. To inherit the sample time, set this parameter to -1. This block supports discrete sample time, but not continuous sample time. How the Delay block supports vairable-size signals for sample-based processing. How the Delay block supports bus signals for frame-based processing. Enable or disable the execution of the Delay block using an enable port. 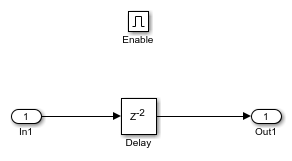 In this model, a ramp input signal feeds into a Delay block. For more information about HDL code generation, see Delay.